What a fantastic performance by iconic Australian singer, songwriter and musician, Paul Kelly at the 2019 Leeuwin Estate Concert! As we await the announcement of the 2020 Leeuwin Estate Concert performer, let’s reflect on what makes this event such a great one! What makes the Leeuwin Estate Concert such an iconic event? When you pick up a fine glass of Australian red, there’s a very good chance that you’ll be tasting something that can hold its own against any of the world’s best. That’s because the land Down Under has built an enviable reputation as one of the planet’s greatest wine producers, and Leeuwin Estate is home to one of Australia’s very finest vineyards. However, this beautiful vineyard, founded back in 1974 in the peaceful Margaret River area of Western Australia, has become just as renowned for for its annual concerts as its fine wine output. Back in the Seventies, the Leeuwin Estate was made up of just a few awkward, adolescent vines, but today those vines have matured into vintage excellence – and so too have the vineyard’s concerts. It wasn’t until 1985 that the first gig was staged at Leeuwin Estate, but it wasn’t without controversy. When the London Philharmonic Orchestra toured Australia 30 years ago, they were funded by Denis and Tricia Horgan (owners of the vineyard) with a very simple condition – that the ensemble play a show on the estate. They agreed, but because Margaret River is so far from a major settlement (Perth is some 267 kilometres away) it was feared that the health and safety of the revellers could be jeopardised. The event was almost cancelled, but still went ahead – 5,000 people descended on Margaret River, and the show went off without a hitch. Ever since, the concert has taken place with a broad variety of famous faces making the headline act, including names such as Ray Charles, Diana Ross and Tom Jones. 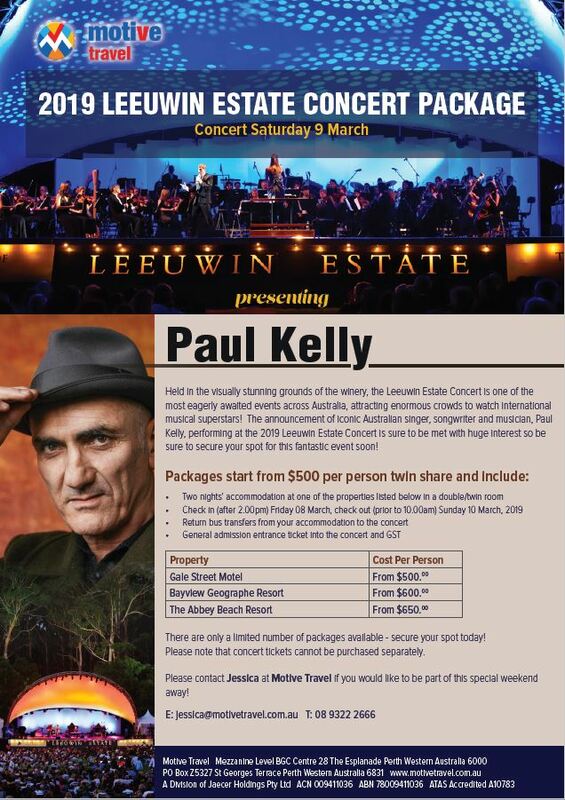 Would you like an idea of what’s included in our Leeuwin Estate Concert packages? Then click here for what we had on offer for 2019! We’ll update this page with our 2020 Leeuwin Estate Concert package details as soon as the performer is announced in early 2020. In the meantime, if there is anything you would like to know about this event, please feel free to contact us!